A new company prints 3-D models of human organs to give doctors trial runs before complicated surgical procedures. HOUSTON (KTRK) -- "It's hard to have one cancer and then hear you have another cancer," said Charles Lewis as he sat in the Houston headquarters of Lazarus 3D. Three years after developing the blood cancer Myeloma, doctors told him his right kidney had also developed a massive tumor. Knowing he would need another round of chemotherapy and as much kidney function as possible to sustain the powerful drugs, he went in search of an answer that would give him enough function and strength to fight off both cancers. That answer came by way of a group of doctors at Baylor College of Medicine in the Texas Medical Center, using cutting-edge technology: 3-D models of a patient's anatomy. "He had a complicated tumor that was pushing the envelope a little bit," Dr. Richard Link recalled of Lewis' case. 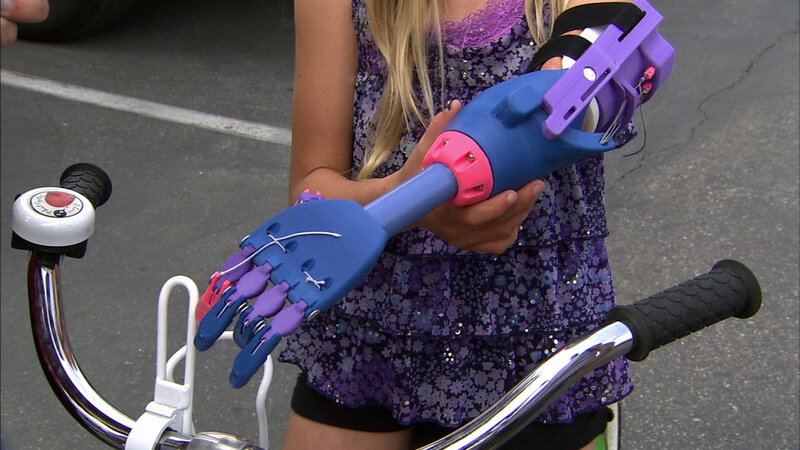 A 7-year-old Southern California girl now has a new artificial hand thanks to 3-D printer technology. Working with the Houston-based company, Lazarus 3D, an anatomically correct model of Lewis' tumored kidney was printed using life-like tissue. "With a soft model, you can actually really practice what you wouldn't know from just looking at the data," said Jacques Zaneveld, CEO of Lazarus 3D. With time of the essence and only 30 minutes on the clock to cut the tumor out, Dr. Link performed the surgery on the 3-D printed model first, then on Lewis' actual kidney. "When you clamp the artery to the kidney, you then have a particular amount of time to then leave that artery clamp before it has permanent damage," said Dr. Link. Finishing in just 28 minutes, two precious minutes less than his practice on the 3-D printed organ, Dr. Link was able to keep 95% of the kidney Lewis would count on for chemotherapy treatments. Lazarus 3D is now working to mass-produce different prototypes for doctors and residents to use for training. "Tiny Tim" is a kitten that, along with his siblings, was saved from a euthanasia list at a South Carolina animal shelter. However, a new set of challenges await this survivor. "Only 25% of emergency medicine residents get to do this procedure during their entire residency," said Zaneveld. "If you can hold it in your hand, you will be able to learn it much more quickly," added Dr. Link. As for Lewis, he's grateful for this latest technology, which was developed in the heart of the Texas Medical Center, "I'm not the doctor, but I think without the model, he would not have been able to do it." Baylor College of Medicine is studying surgical outcomes on the more than a dozen patient cases that have used 3-D printed patient models to learn if the technology helps reduce the learning curve for medical students and doctors, while also providing safer, less expensive surgical care for patients.